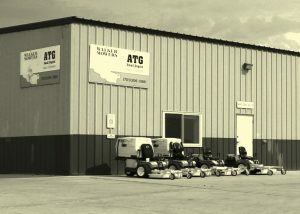 Out Front Power was founded in 2004 as “ATG” to support All-Terrain Grounds Maintenance, our sister company and largest maintenance contractor in North Dakota. As All-Terrain grew rapidly in the early to mid 2000’s, they needed a shop that could keep up with their expanding fleet of Walker Mowers. The only solution that provided All Terrain with the 100% support commitment they needed was to open a dealership of their own. The efficiency, quality of cut, durability, and grass-­handling capabilities of the Walker Mower helped All-Terrain grow the mowing business, and other contractors began to take notice of the results and started purchasing Walker Mowers from Out Front Power. Out Front decided from day one to treat those contractors just as they would treat All-Terrain, and guaranteed that other non-­All-Terrain equipment received priority treatment. To this day, Walker Mowers are the far-and-­away #1 choice of commercial mowing contractors in the Fargo­/Moorhead area. While technically All-Terrain may be considered their “competitor,” contractors understand Out Front’s 100% commitment to supporting the contracting business and work with All-Terrain as partners. All-Terrain and Out Front remain two separate businesses under the same ownership. Being Real: No hype, overselling, or empty promises. We are honest with our customers, team members, and vendors, and we ask the same in return. Customer Experience: We strive to make the customer experience the best in the industry. Give Back: We’ve been blessed and we want to be a blessing.